When I go to the theatre, I love a good story. Something that catches me and involves me right away, and keeps me involved and interested through out. Along with keeping me interested, if it makes me think and introduces me to new ideas and concepts - even better. 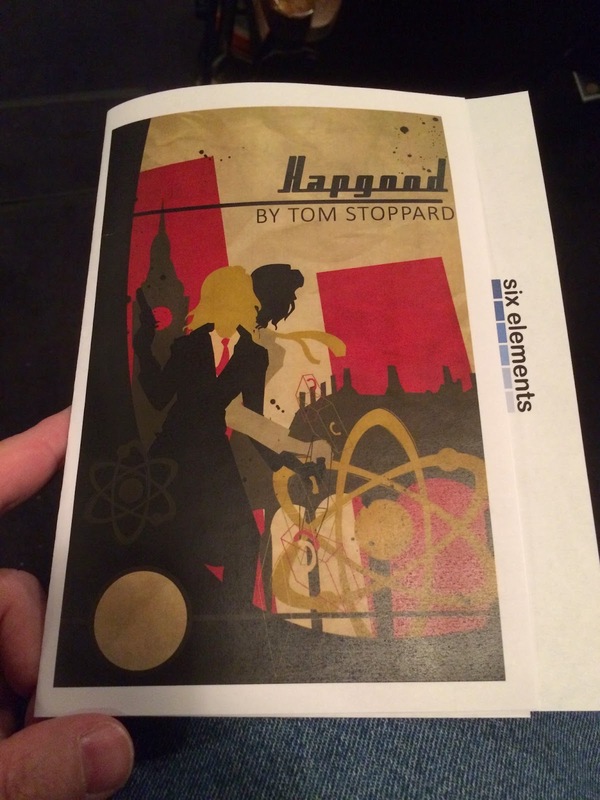 To paraphrase the Bard himself, "the script is the thing..."
Hapgood by Tom Stoppard is exactly such a script. It is currently being performed at Nimbus Theatre by Six Elements Theater. In my limited experience with Stoppard, I know that he writes dense scripts - usually combining philosophy, science, mathematics with a love story, or historical drama, or even Shakespeare. In the case of Hapgood, he combines a great, thrilling spy story with physics. How? Well, take my advice and go see this show. The opening scene is worth the price of admission itself, and the remainder of the show does not falter or disappoint. Russian spys in Britain during the Cold War - can you ask for more? The script is solid, the acting was fantastic and it is truly a very enjoyable evening in the theatre, as well as one that will keep you on the edge of your seats. The cast is great with consistent Russian and British accents through out. The story moves quickly, even though it is a talky work (like most Stoppard). I sat in the back row and there were a few times that I had trouble hearing some actors, but I was leaning forward in my chair far more because I was truly intrigued by what was happening, and involved. What also caught my attention was the scenic design. The show opens in a pool changing room with showers on one side, changing stalls with doors, two entrances, and a sink at the front. Following scenes took place at the zoo, the shooting range, an office space, and an apartment. These are a LOT of locations, yet each one was realistic. On a big budget, this would be easily down with fly space and lots of off-stage space. Nimbus doesn't have that. The design was similar to those flashy metallic cubes that are connected at the center so you can keep opening it up and it changes, but stays the same. After the opening scene, the changing stalls come apart, and are turned around to create walls, the shower curtains fold against the wall, and suddenly the set is totally different. It was a brilliant design that was simple, yet totally versatile. With each scene change needing a bit more time, they were covered by some great 60's spy-movie style music, along with a stagehand/actress making sure everything was where it should be, then putting hand to ear as if listening to orders from someone off-stage. It was a really good idea. The other thing that kept the scene changes fluid is that actors from the new scene would enter while the change was happening, and begin playing in the space - putting flowers in a vase, straightening files, etc. Fantastic way to keep the audience involved in what was happening. If you want a good theatre experience, go see this show. So smart and thrilling - twists and turns through out. Delicious.